On an interesting note, the 2018 White House Christmas Tree for the Blue Room was selected from Larry Smith Mountain Top Frasier Fir tree farm from Newland, North Carolina. The Blue Room tree is an 18’ Frasier Fir and is decorated with 1,000 ornaments. A cherry picker is brought in to decorate the top of this stately tree. The Blue Room’s antique chandelier is removed so the tree top ornament will almost touch the ceiling. It is very exciting to see the fresh tree and trees brought in to the White House for decorating. I have been honored in the past several years to serve as a “volunteer” Holiday designer/decorator at the People’s House. 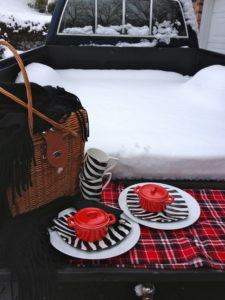 A red, black and white plaid blanket provides a warm and cozy tabletop for the truck tailgate. 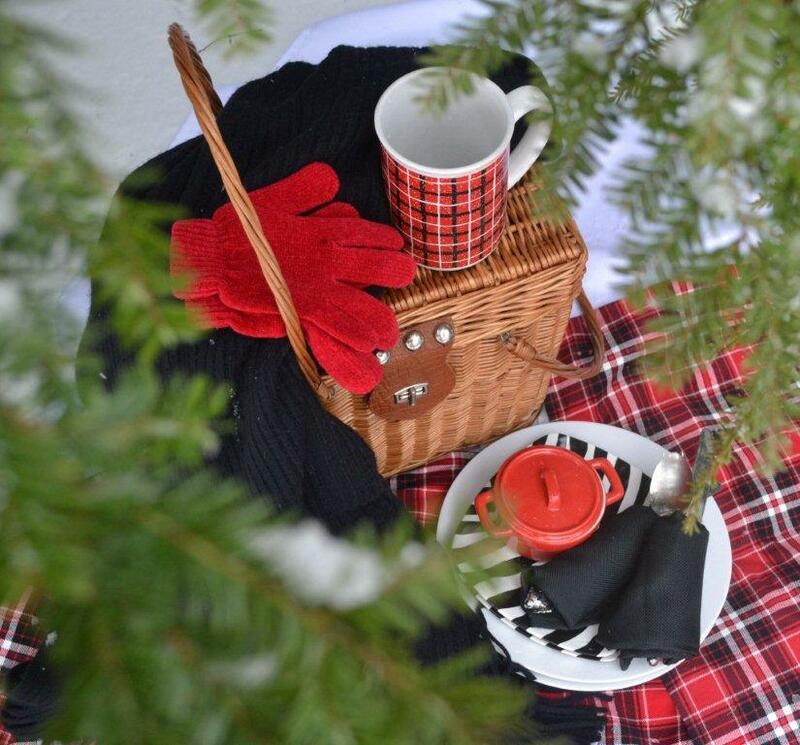 The white dinner and zebra salad plate serve as chargers for the mini red cocottes while the black and white striped mugs are waiting to be filled with a hot beverage. Black napkins are rolled tightly with silverware and are stacked by the plates. For this tailgate, porcelain dinnerware was used but melamine would be a great and welcomed substitute. Part of creating a memory is using the very best dinnerware and ingredients for the simplest occasion, even if it requires more work for the host. In large saucepan, combine, milk, coffee, syrup, 3 T. caramel sauce and 2 teaspoons cocoa over medium heat, stirring occasionally until simmering but not boiling. In small bowl, beat the heavy cream until it begins to thicken, add maple syrup and powdered sugar, beat until stiff peaks form. Serve with mocha. Drizzle with caramel sauce and dust with cocoa. In a large saucepan or Dutch oven combine broths, tomatoes, beans to a simmering boil. Add tortellini and cook 10 minutes over medium heat. Stir in all seasoning and spinach and kale leaves, cook until leaves wilt. 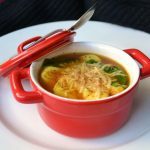 Serve soup in mini casseroles or soup bowls, garnish with shredded Parmesan Cheese and crusty rolls with Olive oil dipping spices. Cream butter, sugar and salt until light and fluffy, about 3 minutes medium speed. Add whole egg, vanilla and almond extract. beat until well-incorporated. Add flour; beat at low speed just until flour is blended. Divide dough in halves or thirds and wrap in plastic wrap. Refrigerate until firm, at least one hour and up to 2 days. Dust work surface and rolling pin with flour. 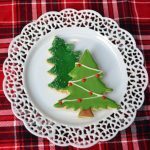 Cut out cookies with Christmas Tree Shaped Cutter, place on baking sheet. Bake until cookies are brown 10-12 minutes. Remove from cookie sheets to cooling racks and cool completely before decorating. Turn on mixer (use whip attachment) and, while motor is running, slowly stream in the water. Mix until everything is incorporated. Turn mixer to high speed and whip until stiff peaks form. Add flavorings and mix well. Change to paddle attachment for stand mixer If using a hand mixer, use the same beaters you were using before. Add remaining powdered sugar and shortening and whip for 2-3 minutes more. Use tip # 5 pipe a line of green frosting around outside edge of cookie, flood cookie with green frosting. Let dry completely. Pipe decor on tree with remaining tip # 2 or 3. Yield depends size and shape of tree cookie cutter. Liz Bushong is an expert in the three-dimensional art of entertaining. She transforms simple dining occasions into beautiful and memorable moments by adding a touch of her own “sassy style”. For the past several years Liz has been entrusted to decorate several high profile homes for the Holidays including the White House, Vice Presidential Personal Residence, Governors mansions and more. She is a featured monthly guest chef/designer on regional CBS/ABC Affiliates Daytime Tri-Cities, Daytime Blue-Ridge Roanoke and other television shows. Liz is the author of Just Desserts and Sweets & Savories cookbook as well as contributing writer for several magazines including VIP SEEN & Lovely Bella. 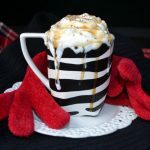 All recipes, food styling, photography and article are created and developed my Liz Bushong.